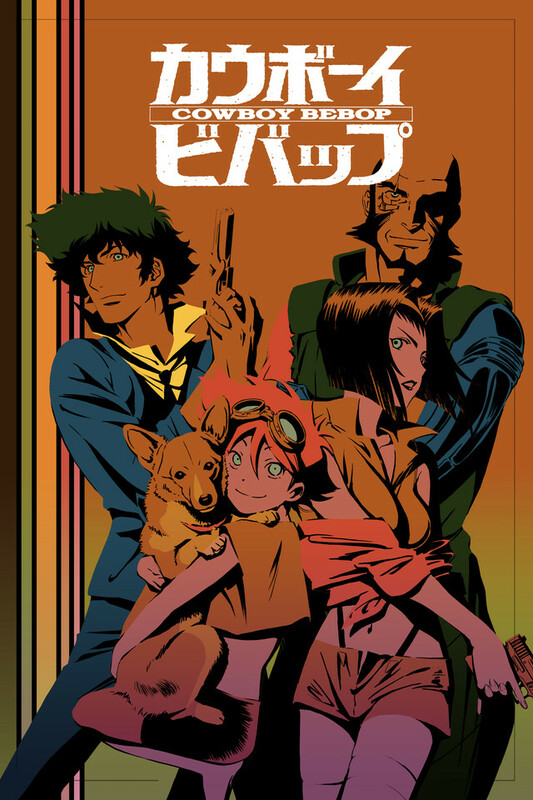 If you haven't heard of this series before, it's Cowboy Bebop. GO WATCH IT. If you have heard of this series before, GO WATCH IT. No description or review is needed. You'll only be wasting your time if you dislike episodic-styled shows, western-scifi, or good things. It's Cowboy Bebop motherf*****, why are you still reading this? This, along with FLCL, are what shaped my interests as a teenager into the anime/manga love that I can't imagine my life without now. It is full of action, a magnificent soundtrack (seriously one of the best OP ever) and a story that follows everything from love to terrorism to hallucinogenic mushrooms as it takes you on a ride you will never forget. If you have not seen this yet, set aside all prior obligations and treat yourself to what has been consistently listed as one of the best anime ever to grace the airwaves. You will thank me later. Watched this multiple times back in highschool when it was on Adult Swim. What can I say? This anime is something Id recommend to anyone to watch. The characters, the story, the art style and design... everything about this anime is amazingly well done. And the ending... not to spoil it but... it's sublime. Worth every minute of your life you spend on it. See you later, space cowboy! Seriously, there probably isn't a better modern anime out there. Great animation, awesome music, incredible stories, and wonderful, fully realized characters. The English dubbing is very good as well. For once, I prefer it over subtitled. Probably because I think that the voices fit the bodies a little better. Spike sounds more like a slacker, while Jet sounds gruffer, and Faye Faye is just about perfect. Edward is greatness as well. And of course, Ein rules. Trust me on this. If have not seen this and are on chrunchyroll then you have missed a step somewhere. This is arguable one of the best action anime ever made and is one of a handful of anime that made the genre popular in the rest of the world. It is not a stretch to say that without Cowboy Bebop we might not have western anime sites at all. If by some chance you have not watched this then sit down and get ready for something special. It has its flaws, it starts out slow, but it is unique and it is good, definately a classic. oh wait it looks like I have to enter in 100 more characters, what is this, the opposite of twitter? Well now this just feels forced, I dont want to write all this, eh whatever, deal with it crunchyroll. This anime is known as being on the same level as Yu Yu Hakusho, Dragon Ball Z and Rurouni KenshinThink of it as a more serious Space Dandy. A must watch for any anime fan. FYI: This is the first review i have written on Crunchyroll since a joined 5 years ago! This is where you start. This is where you take that skeptic of Japanese cartoons. No one can deny the cool; the characters; the music. In anime terms, it is the flag that will turn the most hardened tsun into a dere. It is as much art as it is entertainment. This is also one of those spectacularly rare occurrences where the English dub is a better experience than the original voice acting cast. No disrespect to the Japanese cast, but there is a chemistry in the English acting that pairs incredibly well with the character's personalities. I recommend viewing it with the English dub, if available. Before you know it, you'll be talking to bansai trees and frogs on the staircase, swimming through the bathroom, wrapped up in toilet paper with lipstick smeared all over your mouth. The music. Oh god the music is extraordinary (many written by Yoko Kanno and performed by her band The Seatbelts). The depth and scale of the soundtrack is stunning. The song "Too Good Too Bad" towards the end of episode 4 is one of my favorites but there are so many other examples that to list them would be futile (Piano Black and Rush are also incredible). There are one or two filler/clunker episodes after the half way point, but I don't think anyone really cares and it doesn't detract from the overall body of work here. Cowboy bebop is one of the absolutely best anime and surprisingly where the English version was even better than the original voice actors. The characters all have incredibly rich stories and personalities and the overall show itself never leaves you disappointed. Alright Space Cowboys, time to go.